I came across Marguerite Gavin in the Hollows Series and was iffy about her, but wondered if it was because I already had voices in my head for those characters (I was rereading in audio). Well, now I know that I like her a lot. I don’t love her narration, but it’s a solid B+ for me. Something about her voice for Kitty was absolutely perfect for me – it carried a radio personality perfectly. Her voices for other characters, although distinct, was a little less than perfect for me. Particularly some of the male characters, who came out sounding a bit too forced masculine for my taste. All in all, I loved her for Kitty and her voices for the men weren’t perfect, but good enough that I definitely plan to continue listening to this series. Ok, so Kitty and I didn’t like each other at first. See, she had all this potential to be someone I could love and then I find out that she’s uber submissive. Like annoyingly, pathetically so. But as the story progressed a few things happened to change my opinion of Kitty. First of all, I learned her back story and that explained a lot. 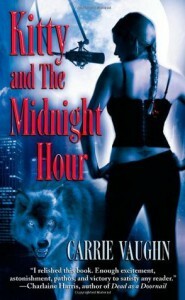 I won’t tell you what happened, because I like the way it’s revealed in Kitty and the Midnight Hour, but how she was changed and the person she was before her change to werewolf really explained why she acted the way she did. Second, and perhaps more importantly, I watched her grow as a character. Through her radio show, she gained an independence and self-worth that she so badly needed and with it she really started to transform. As a character driven reader, this kind of development makes a story shine for me. I loved seeing her transformation and so in the end, I not only love Kitty, but I’m really glad she started the book so annoyingly submissive. Clearly Carrie Vaughn knew what she was doing. As for the other characters, I have to say that like her radio show, this is really a one-woman act. There are a full cast of other characters and they’re developed just enough for you to have the desired response to them. There’s the best friend that you love, even when he frustrates the hell out of you; the alpha that you’re on the fence about, but think you hate; the stereotypical cop that you respect but wish would stay the hell out of this stuff. Cormac, the love-hate interest, was an interesting figure but sadly a bit forgettable for me. He went from enemy to trusted ally to quickly and easily for my liking, though I absolutely loved their dialogue. I think what I’m getting at with these characters is that, they do the job to move the story forward, but besides Kitty, they’re all a bit predictable and too easy. I loved the way this story was told perhaps even more than the story itself. Kitty is a late night radio host who inadvertently turns her show into a paranormal talk show. And it becomes a major hit. And a major problem. She’s getting syndicated and lots of attention; becoming a real hot shot, making serious money. At the same time, however, some supernaturals (particularly some vamps in her area) don’t like what she’s up to and she’s ordered to back down. That sets up the major plot tension, although a murder does happen that Kitty gets involved with investigating, but for me that was really a back drop. The real tension, for me, was Kitty’s fight to become and remain independent, through her radio show. Huge segments of the book take place while Kitty is actually doing the show. I loved this. It was so unique and Vaughn writes dialogue so brilliantly that it just works. I also think that listening to Kitty and the Midnight Hour rather than reading it only amplifies the brilliance of this storytelling move because I felt like I was listening to the actual show a lot of the time. Gavin does a great job of showing Kitty’s radio persona/voice as something just slightly different from her regular one, so that made this spectacular. The mystery was solid (surrounding the murder) and I didn’t figure it out until maybe seconds before Kitty, which is always a good sign. That last 15% was fairly shocking, including one heart-wrenching moment, and I gobbled it up. For me, this was a really positive start to a series. The world was pretty much your staple Urban Fantasy and I settled into it quickly. I’m ready to see what’s next for Kitty and I’m hopeful that some of the other characters will have better development as the series progresses.